Follow up happens after the wheelchair user has received their wheelchair and has been using it for a while. Follow up appointments are an opportunity to; gather information from the wheelchair user, check that the wheelchair is in good working order and check the fitting of the wheelchair. All users will benefit from a follow up visit, particularly children, users at risk of developing a pressure sore, users who have a progressive condition and those who have had difficulty with any of the training or instruction given to them. Most intermediate level wheelchair users need additional postural support, and therefore follow up is particularly important. There is no rule about when follow up should happen though one follow up session within six weeks of the date of delivery is often found to be useful. it will depend on the needs of the user. However, for children, it is ideal if follow up occurs on a regular basis at least every three - six months, as their needs can change quickly as they grow. At the follow up the wheelchair service personnel should check that the wheelchair is in good order, provide more tips or training. If needed the service provider may re-adjust the wheelchair, carry out minor repairs or home maintenance, organize major repairs or assist the wheelchair user to arrange for repairs. 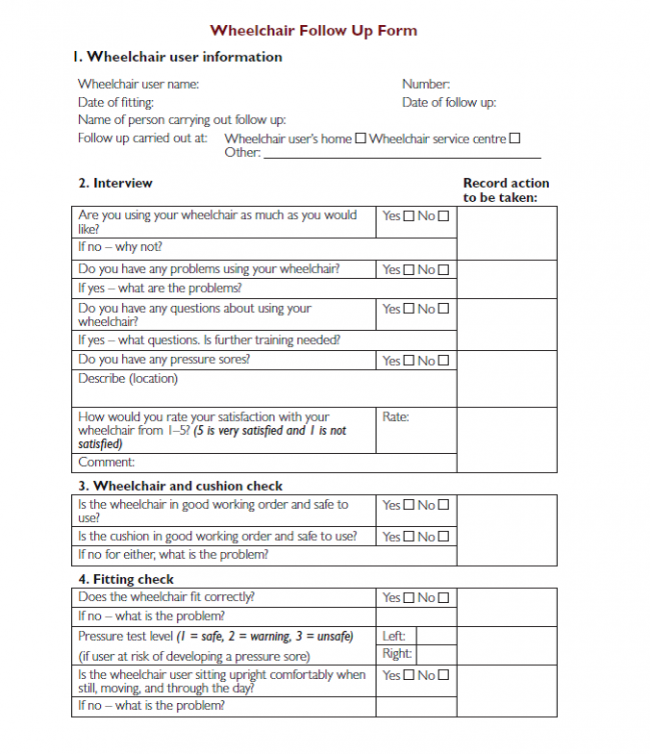 Referring the wheelchair user to another service for support or assistance. Personnel should make a note of any action that is needed after the follow up visit. Give wheelchair users a follow up appointment when they receive their wheelchair. 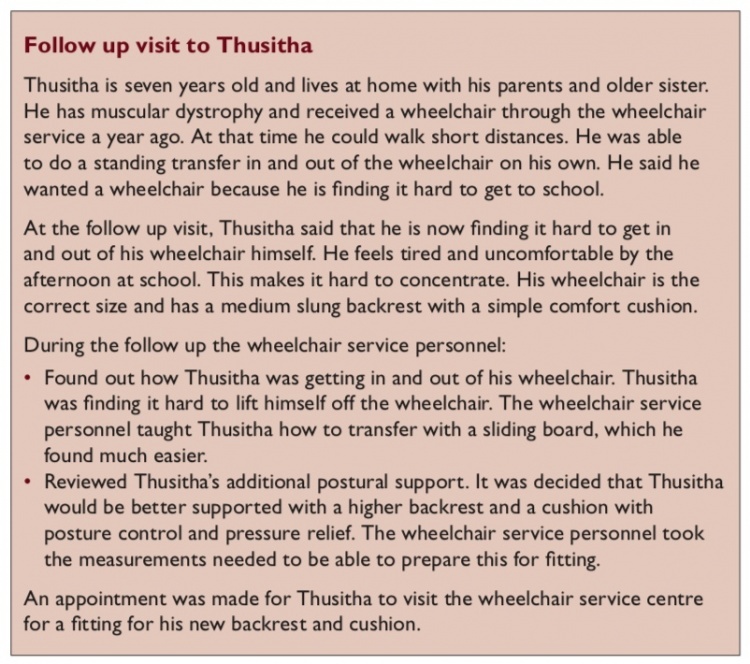 Visit wheelchair users at home for follow up, where possible. Ensure follow up visits are incorporated into routine visits to communities by Community-Based Rehabilitation (CBR) Personnel who have been trained to carry out wheelchair follow up. Arrange a follow up phone call if transport is difficult and the wheelchair user has access to a phone.